It will take Alexis Sanchez a little time to win back the hearts of Arsenal supporters after it became abundantly clear that he want to leave the club for Manchester City at the end of the summer transfer window. The Chile international received a few boo as well as applause from Arsenal fans when he came in the match 75th minute to full time against Bournemouth on saturday. 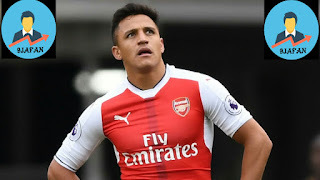 However Alexis Sanchez will be acutely aware that the bad felling towards him will disappear if he knuckles down and performs for his current employers, even if he refuses to sign a contract extension. Without the unsettle South American in their starting line-up, Arsenal produced their best performance of the season against the Cherries. However, whether this was a case of Arsenal playing well or Bournemouth performing terribly is up for debate. Perhaps it was a bit of both. WILL WENGER START WELBECK OR ALEXIS V CHELSEA? Danny Welbeck scored two goals in the win and will feel he’s done enough to retain his place in the starting line-up, ahead of Alexis, for next weekend’s clash against Chelsea at Stamford Bridge. But Wenger knows that leaving the world-class Chilean out of his line-up for such an important match will lead to yet more heavy criticism if his side suffer yet another morale-sapping defeat. The veteran French coach could have been forgiven for wondering whether Alexis would return from international duty in the right frame of mind following the wave of reports claiming he was devastated after his move to the Etihad Stadium failed to materialise. However, Wenger has revealed what Alexis said to him after they met up last week - and it will reassure Arsenal fans. "He told me he's focused to win the Premier League and Europa League and ready to have a go." That’s all Arsenal fans expect. Wenger also dismissed reports that Alexis turned up overweight. "He is not fat - his fat percentage is under 10 per cent,” he added. “You know how it is, when you do not win, people will find problems. Will Alexis Sanchez perform as well for Arsenal this season? Have your say by leaving a comment below.